In its 11 p.m. advisory, PAGASA said the typhoon, which will be named locally as Ompong when it enters the Philippine Area of Responsibility (PAR), will threaten Northern Luzon. Heavy rains and strong winds will be experienced in the provinces of Cagayan, Isabela, Apayao, Kalinga, Abra, Ilocos Norte, and Batanes. Senior weather specialist Chris Perez said the typhoon is expected to enter the PAR on Wednesday, September 12, and will be felt in the country until Saturday, September 15. He said a tropical cyclone warning signal advisory may be raised over Cagayan Valley as early as Thursday, September 13. 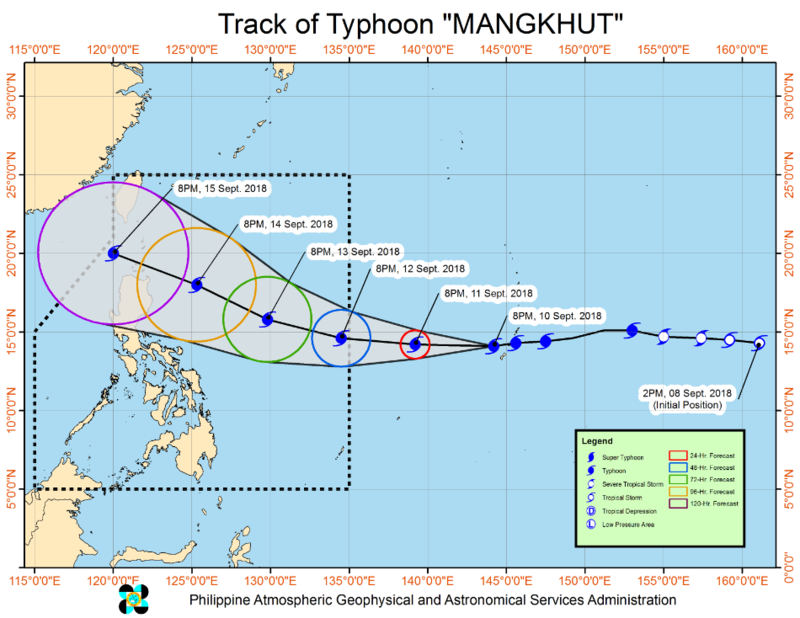 In PAGASA's latest forecast track, Mangkhut was last spotted at 2,135 kilometers east of Southern Luzon. It is moving at 25 kilometers per hour (kph). The typhoon is currently packing maximum sustained winds of 160 kilometers per hour (kph), with gusts of up to 195 kph. Once it enters PAR, PAGASA said Mangkhut may reach its maximum sustained winds to 210 kph, with gusts of up to 260 kph. Under PAGASA's tropical cyclone intensity scale, a typhoon has to reach in excess of 220kph maximum sustained winds to be categorized as a super typhoon. 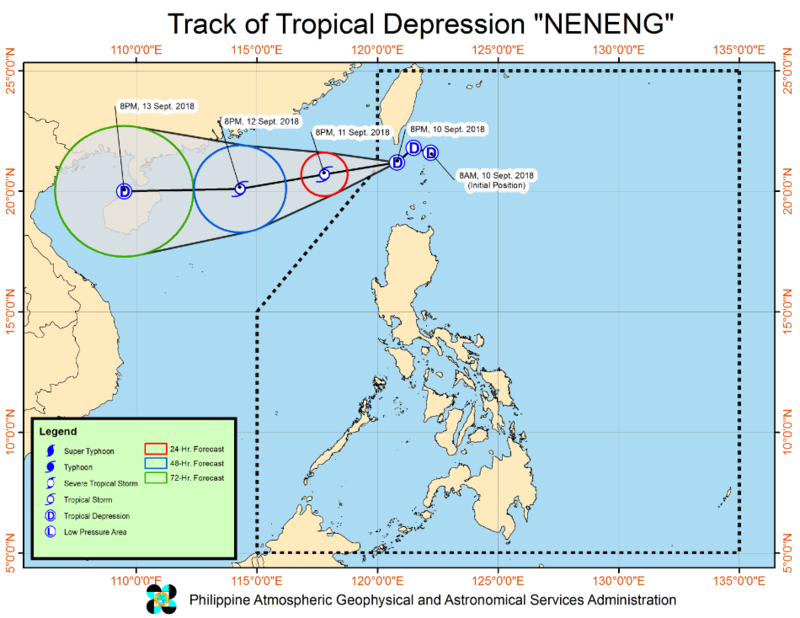 Meanwhile, tropical depression Neneng has maintained its strength while moving southwestward near Batanes. Tropical cyclone signal warning number 1 remains hoisted over Batanes. PAGASA said the trough of Neneng will also bring moderate to ocasionally heavy rains over the Babuyan Group of Islands. Ilocos Provinces and Cordillera Administrative Region, meanwhile, will experience scattered rainshowers and thunderstorms. Neneng is expected to leave PAR on Tuesday, September 11. According to PAGASA, more tropical cyclones are entering PAR. The peak of typhoon season is July through October, PAGASA added.